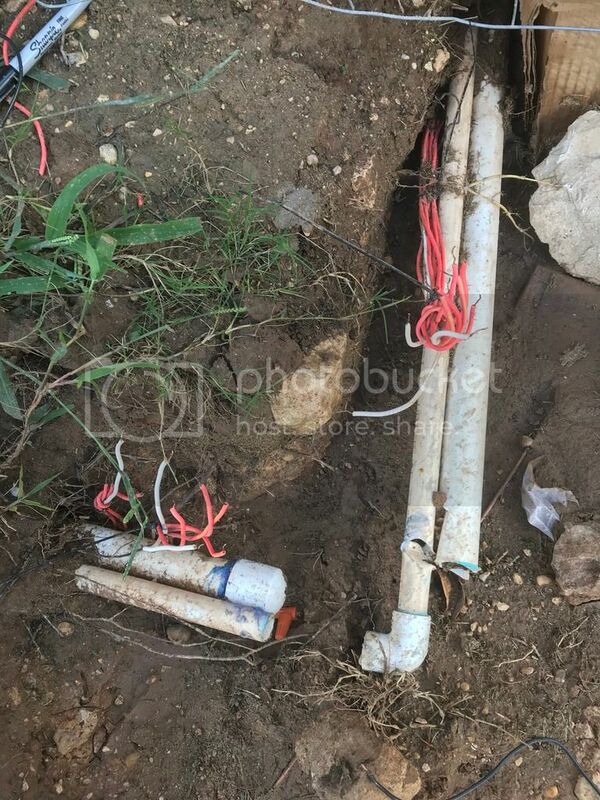 My pool installation company cut a bunch of my valve electrical lines during excavation. I am having some trouble figuring out what line goes where. There are 7 red wires and 3 white wires that have been cut. What is the best way to connnect these back in the right order? Tip number 1. Stay calm. Something like that can be overwhelming if you don't have a clue what to do. I would determine which white wire is the common wire/s. Turn on number 1 then go to the wires and see which white wire is the common. You can use a multimeter to see which two wires give you about 24V. One white and one red. Then you know the common wire and the number 1 wire. You can touch the active red wire to the other wires one at a time to see when number 1 comes on. When it does, hook it up. You'll also be guessing at which of the three white wires is common on the other side. But there's only 3. Trial and error. Or you can use the multimeter on the valve side of the cut wires where they are cut. Test one white and one red at the same time and see what the reading is. Most solenoids come in around 26 ohms but Rainbirds come in at 45 ohms. Try all three white wires with one of the red wires one at a time. Two should give you a reading. The third will be something different. So basically. Multi meter for volts on one side then ohms on the other. Determine the two common wires and the rest should be simple. Ha! Yes, staying calm is the hard part. Thanks for the help, I will try this out tomorrow and see what additional questions I have! I’m still having issues finding the common wires. With one combination I am getting around 45-60 ohms but once that occurs I no longer am getting the 24v and I cannot get anything to turn on. Can you post a picture of the wiring at the controller? 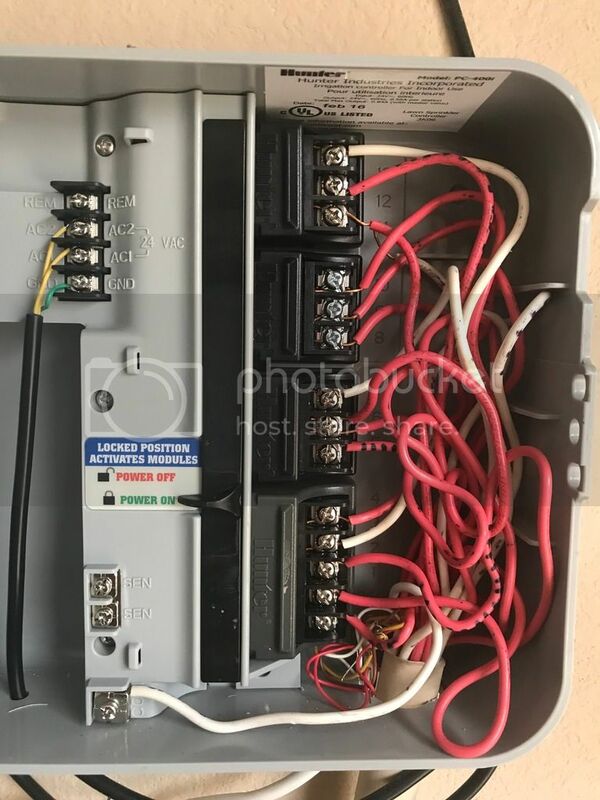 Is there two white wires hooked up to the common terminals and one white to number 3? No other whites yes? Do this, turn on number one for an hour or whatever so it doesn't turn off while you're working on it. Now put one lead to one of the white wires where they're cut. Then one to each of the red until you get a reading of 24-26V or so. That should be the common wire and the number one wire. Now try that number 1 red wire with the other two whites. Does one of them also read 24-26V? That's the other common. The third white wire is number 3. Once you've figured the two common wires, you can turn them on 1 station at a time to figure the other wires. Now you know the wires leading from the controller to the break. All this is from the break to the valves. Check one of the white wires with one of the red wires and look for ohms. You can determine which two white wires are the commons because they'll give you a good reading. The other white wire is number 3. Splice the white wires together before continuing. Now either just hook them all up and run through the timer to see what comes on. You can move the wires around at the controller to the correct numbers. Or, you can turn them on one at a time, go out to the break and touch the red wires togeher one at a time until the correct zone comes on. Or you can just leave it alone and the zones will simply come on in a different order but you'll have to reprogram the run times if they're not all the same. Like 10 min each. It really isn't that hard once you get your head around it. Read through until you get it. Or ask more questions. 1. Check for volts at the break on the controller side. 2. Check for ohms at the break on the valve side. 3. Hook up the wires. Commons first. Once you have the commons hooked up it'll be simple. Do this, turn on number one for an hour or whatever so it doesn't turn off while you're working on it. Now put one lead to one of the white wires where they're cut. Then one to each of the red until you get a reading of 24-26V or so. That should be the common wire and the number one wire. Now try that number 1 red wire with the other two whites. Does one of them also read 24-26V? 1 Wire reads 22v and the other 2 read 28v That's the other common. The third white wire is number 3. Here is the controller. The bottom six zones are the ones that do not work. Zone 7 that is is a white wire turns on. You can see there is another white wire that is not connected to anything that I am suspecting may be one of the other whites that were cut. I should have asked for a pic right at the beginning. I knew better. Looks like you have 13 valves and a master valve or a pump. I see 4 white wires. Only one is hooked to the common terminal. I only see 3 white wires in the open trench. I see about 6 red wires. So you have wires going to two different locations. You probably have two solenoids connected together on the 88. Maybe it's the pump. I'm clueless on what a pump would ohm out at. It sounds like you have Rainbird valves. Do you have a pump or is it a master valve? The white wire that reads nothing on ohms isn't the common wire. I'll come back later. I have a master valve, no pump. Correct. There are 13 zones and zone 6 has 2 power wires attached to it. Those 2 wires are also at the cut which makes it a total of 7 red wires. I just noticed that 6 of the reds are ohm at 46 and one is ohm 55-56 when I connect. What I think is the common. I also realized that there is one extra red wire.....I’m sure it’s not turning on has something to do with it.